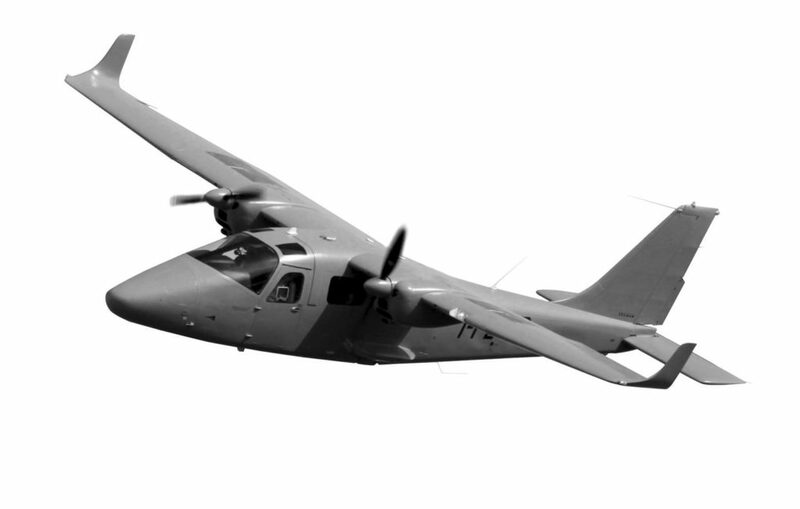 The TECNAM SMP is based on the revolutionary aircraft TECNAM P2006T, the only twin engine aircraft that can fully match all the today special missions purposes due to its characteristics. Ideal range for any type of mission. Fully CS/FAR 23 IFR certified – both analogue and glass cockpit available and validated in many foreign countries in addition to EU/US. Single pilot operations approved also in IFR. Extremely low operation and maintenance costs. 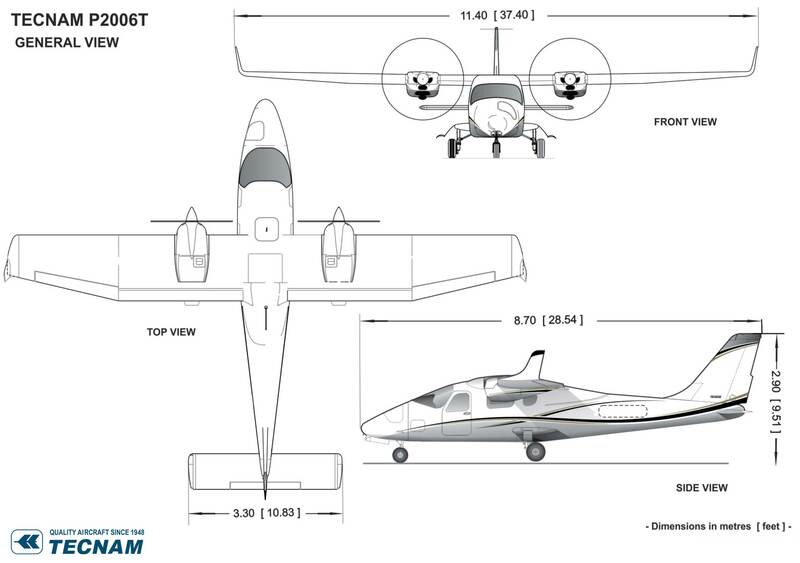 Tecnam P2006T is a twin-engine four-seat aircraft equipped with two four-cylinder four-stroke Rotax 912S3 liquid cooled engines of 100hp (73kW) each with an exceptional TBO of 2000 hours. The high-wing configuration offers stability, cabin comfort and excellent visibility. P2006T is a robust yet very light airframe, resulting in an outstanding payload-to-total-weight ratio. The fully retractable landing gear allows the installation of multiple sensors on the belly avoiding reflections, obstacles and interferences thus maximizing the sensors performance. Two fuel tanks are located outboard of the engines holding 200 liters in total providing 5 hours endurance. The P2006T can be equipped with the most advanced IFR Glass Cockpit Display (Garmin G1000 Nxi) and other navigation aids like Autopilot, Storm scope, DME, etc. The twin-engine configuration of the Tecnam P2006T is extremely dependable, enabling the aircraft to travel long over water distances or over rough terrain. Simple and convenient access to the engine compartment allows for fast daily inspections. Low fuel consumption and minimum maintenance requirements convey in extremely affordable operating costs. The P2006T configuration allows stall speeds lower than 55 kCAS at Maximum TakeOff Weight with very short take-off/landing distances, making it ideal to operate in short runways. This cabin hole is located under the rear passenger’s LH seat. Its dimensions and the extensive room above the cabin floor allow the installation of several types of systems/sensors. 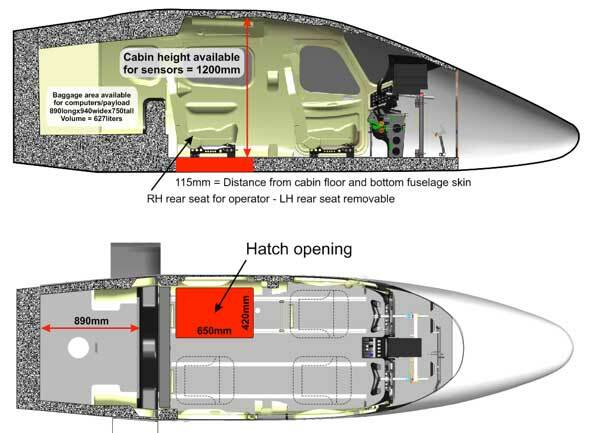 The distance from cabin floor and the fuselage bottom skin is only 4.5in and it is ideal in order to maximize the FOV of cameras, lasers and sensors. T122 (MX10 ref. Mod. 2006_229). This hatch and Wescam MX-10 dedicated fitting plate allows the immediate integration of turret. The fourth seat can stay in place while the absence of exhaust gases, together with the camera “stow” position, allowing this equipment to be the “entry level” law enforcement configuration. T124 This hole is located below the fuselage tailcone. Its dimensions and room allow the installation of gimbal EOS up to 10 inches diameter. This hole can be provided in conjunction with any of the available cabin other holes offering the maximum flexibility when multiple sensor are required on the same platform. The P2006T aircraft standard version is equipped with 14V electrical system supplied by two alternators (one for each engine), each one capable of 40Amp. Most of mission systems, sensors and equipment operate with 28V. Tecnam can offer a really flexible capacity in terms of the electrical system with the Special Mission dedicated electrical system. Basically, this option’s modifications on the airframe allow the end-user to have the following available power sources for mission system with an uncompromised aircraft system safety. Mission system power comes from both LH and RH engines, 70Amp improved alternators + internal generators. 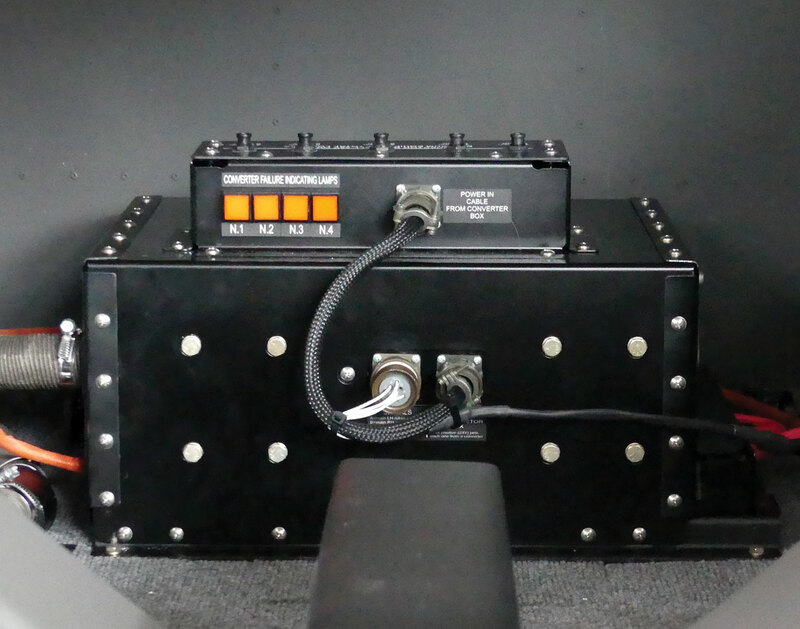 The overall 14V surplus power available for mission equipment is converted by a “converter box” and distributed via multiple connector box supplying 40Amp at 28VDC for mission equipment. The aircraft systems are always and autonomously operative. Several safety provisions allow the mission systems to never draw energy from the standard aircraft system, also in case of OEI operations. A relays system allow to plug an external 12V power unit operate or test sensors on ground, with engines OFF and using the common, P2006T standard 12V external socket. Easily removable for maintenance purposes. The Converter Box is located inside the baggage compartment and weighs just 9kg. T102 6.0 GTN 650 Com/Nav/Gps with Antennas and inst. With GI106A Ind. Big cabin hatch (mod 2006_207) – 650x420mm Non-Additive. Replaces all Standard Avionics.